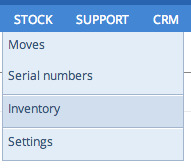 You can generate a stock inventory at any given time. To do this, click Stocks in the main menu, and then choose Inventory. On the page that appears, you will find details on the procedure. Note: You can also use this tool to massively activate stock on products in your catalog. In this case, select the Product without stock activated option. Make your changes in your spreadsheet and save your file as CSV. To update your inventory, click Import platform. You will be taken directly to the Import platform. Then simply choose your import type in the inventory menu. How do I check product availability? How do I manage serial numbers for inventory?